The Susan G. Komen 3 Day For The Cure started bright and early on Friday morning. We were asked to be there between 5:30-6:30 am. My Mom and I parked at about 5:45, and walked to McDonald’s for a breakfast sandwich and coffee. There was a guy there (obviously a walker) with his head shaved, save for the pink breast cancer ribbon left on the back of his head. Soon, we headed back to where Opening Ceremonies would be held (at Southdale Mall in Edina). We joined up with the rest of our team: Carrie Malicki (@CarrieMalicki) and her mom, Peg Traeder (both of whom are fighting breast cancer), Tennille O’Connor (Carrie’s sister), and Krista Donaldson (Carrie’s sister-in-law). 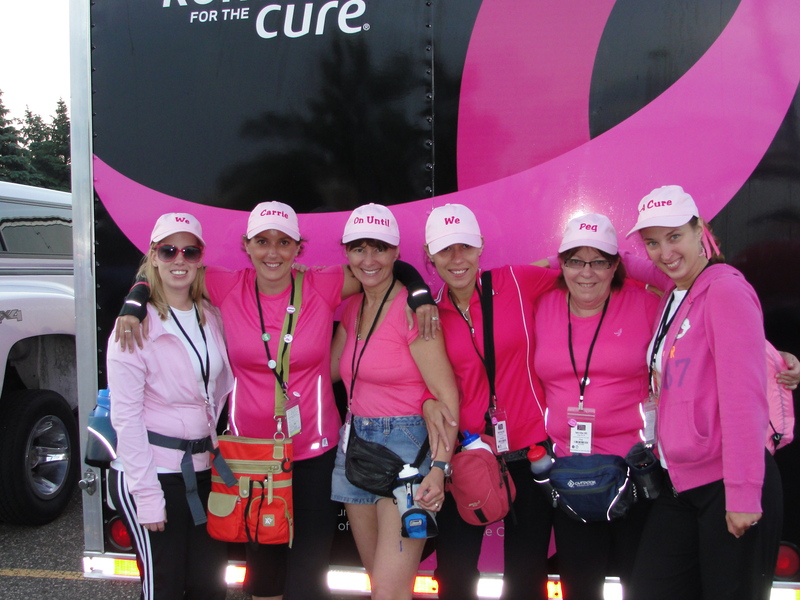 As we joined our team, we were a little overwhelmed by the amount of pink! The opening ceremonies started with some stretching, Lil Honcho performing a great tune about fighting cancer and walking, words from someone from Susan G Komen, and then the most amazing voice, Dr. Sherrie, our cheerleader and emcee for the weekend. People started coming up on stage with large flags with the words of who they are walking for, then words of inspiration. Finally, a group of 8 survivors came out to the center circle, and the memory flag was raised. A word about the flag, I didn’t see the sign, and the guy standing there said to write the names of who I was walking for. I wrote Carrie’s name, and Rosie (Jason’s grandma). Carrie said to me, “I’m not dead.”…as they raised it, I realized, I was misinformed… oops. I hope to never have to write their names for real! The ceremony was great – then we got to start walking. People were lining the ceremony and the street we went out on. They were cheering us on, and giving high 5’s. Soon, we came to our first Pit Stop. What surprised me, was the amount of food being handed out. About every 3 miles or so, was a pit stop or “grab & go”. The pit stops had a medical tent to take care of blisters, etc. All stops had port-a-potties, snacks, water and sports drinks. Most pit stops had string cheese, crackers, these super awesome graham cracker peanut butter & jelly snackwiches, fruit, etc. Surprisingly, the lines for the potties were not as bad as I expected. This first day, we spent each pit stop resting our feet and legs, etc. The energy level was high, and everyone was enjoying the walk so far. We walked from Edina, to the grounds near the Basilica in Minneapolis, where we ate lunch. Lunch was provided by Panera. Many people were excited by this. I don’t tend to care for Panera, the bread on the sandwiches was a bit heavy, but after walking that much, we knew we needed to eat. It felt really good to take our shoes off during lunch, and then to change into clean socks before heading out again. By this point, we weren’t too sore, but did stretch at each stop, which helped. As we walked, we came across many people along the way who had decorated their yards, and were out cheering. There were also random other people out along the trail, cheering us on, clapping, saying “thank you”, passing out stickers, tattoos, icees, candy, gum, water bottles, or spraying us down with squirt bottles (that felt SO good). It was awesome in a way that words can’t describe! Some of those people also had radios going with upbeat music playing… “Beat it” by Michael Jackson was a common one we heard. About halfway between lunch and camp, we passed the Guthrie, where a friend of mine (@TrishZV) posted a sign in her office window to cheer on our team, and me. Seeing my name on one of that sign was inspiring! I was glad for twitter, so I knew she had done that! Shortly after passing the Guthrie, my Mom took a sweep van to the next pit stop. She was having some major muscle pains in her stomach and groin. We met up with her at the next pit stop, and she walked the last 2 miles in with us. The site of the bus at the end was a welcome sight! We then had about a 20 minute bus ride to camp. What a relief on our feet, and a chance to get out of the 80+ degree heat. We got to camp, set up our tents, ate, showered, etc. Who knew there were semi’s with showers in them?? Man, that shower felt SO good! Dinner at camp was delicious – chicken, mac & cheese, sausage, meatballs, penne pasta, steamed veggies, 2 kinds of salad, and the most awesome carrot cake I have EVER had. 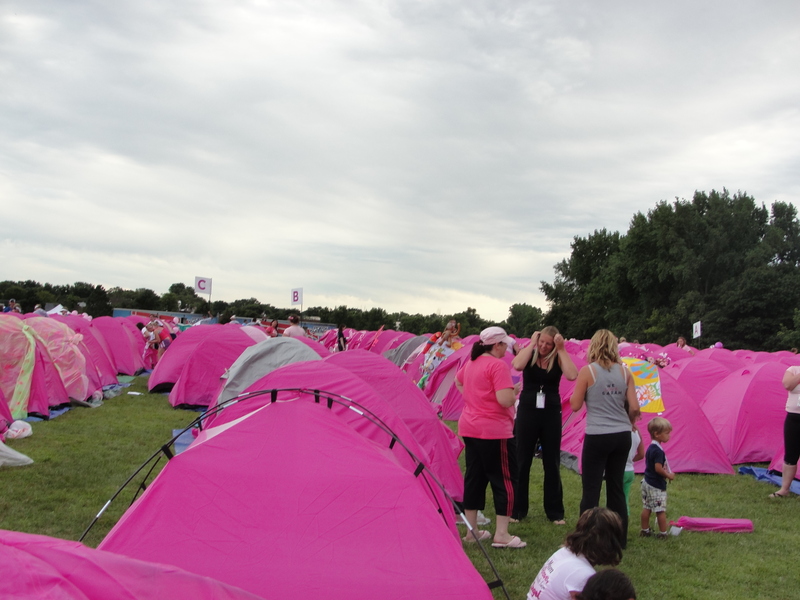 Among the sea of pink tents, was “Main Street” of vendor tents. There was the Shop3Day tent with shirts, etc., the Bank of America tent with massage chairs (they did both back & feet, and felt amazing), the New Balance tent (where they were giving away shoelaces, under eye stickers, and more). There was also a huge medical tent with chiropractors, Dr.s, medical students, nurses, etc. My mom took advantage of the medical tent, and had some blisters wrapped. Another girl near me saw the medic due to a rash on her legs… I realized, I had this same rash. They call it “The 3 Day Rash”, and they told her most walkers would have it by the end. It didn’t bother me, it just looked gross. I had 3 blisters (both my pinky toes, and one on my 2nd toe on the left foot. I decided I would get them wrapped at the medical tent before I left the next morning). We had sore muscles in places, we didn’t even know we had muscles – despite all of our training. The one in the best shape was the one who didn’t even train much. What’s with that?? By the end of Day 1, I had 19.7 miles under my belt (plus the walking around camp looking for tents, etc). We had walked through some beautiful neighborhoods and scenery. We walked from Edina to Minneapolis, to St. Paul. Never in a million years would I have thought I would have walked that far! By 9:30, I was exhausted and in bed. It was as exhilarating as exhausting!